RED BULL LIGHT UP YOUR CITY - if you are a fan of Red Bull or in fact even if you aren't, I am sure you have seen the new flavours. We all know that Red Bull know what they are doing when it comes to marketing their products and you might have even been subject to free samples. Anyway back to what I want to talk about, Light Up Your City. As always Red Bull have set the scene for something great, and has pitted Durban, Joburg and Cape Town against each other for a chance to see your city "light up" on the 5th of November. That is very close now, so if you want you city to win then you better get on it. The competition is held on twitter so if you are not on the Twittersphere yet, wake up! 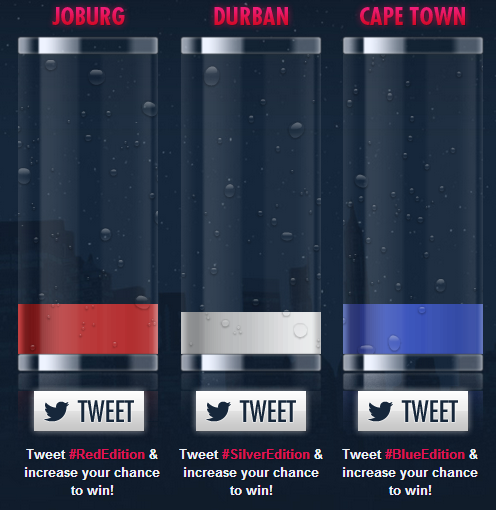 Since I am in Cape Town at the moment I would suggest that you all vote for CT and tweet #BlueEdition just so I get to see what Red Bull has in store for us. You can go check out the site here. If you look below you can see that all the cities are actually still pretty close, with CT having the slightest lead....come on the Mother City.